Planning is the most important part of achieving a successful kitchen remodel. Kitchens are the hub for modern life at home. As such, it’s no surprise that homeowners are spending more money on kitchen remodeling than any other home improvement project. Completing a kitchen renovation can bring significant value to your home. According to the National Association of Realtors, about 67% of the initial project cost can be recovered at the time of the home’s resale. Here are a few strategies to help you maximize your return on investment and make smart remodeling choices. Plan, plan, and plan some more. The National Kitchen and Bath Association recommends at least six months of planning. This process should take longer than the actual construction. Study your existing kitchen and make decisions that will minimize construction mayhem. 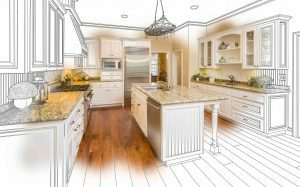 Don’t be afraid to ask for help, as a professional kitchen designer can go a long way toward simplifying and possibly speed up the kitchen remodeling process. Examine your kitchen footprint. If you are trying to keep costs down, changing the location of your sink, appliances or knocking down walls will drive costs up. However, the benefit of moving such items may give your kitchen greater function and a better overall appearance. Storage is more important than space. Additional storage will never go out of style. If you’re sticking with the same footprint, consider installing cabinetry that reaches the ceiling. You can gain valuable storage space and get rid of the need to dust cabinet tops. Have your kitchen designer show you all of the convenient interior accessories available to make the best use of hard to reach areas in your kitchen. Don’t overlook quality lighting. Lighting can make a world of difference when it comes to an effective kitchen design. Your lighting should work to make your kitchen environment safer and more efficient. And, to set the mood for those special occasions, don’t forget to include dimmers wherever you can. Resist low-quality bargains. Functionality and durability are always the top priorities for a kitchen or bathroom remodel. Choose products that will provide low maintenance and long warranty periods. A successful kitchen or bathroom project should last a very long time. Using bargain materials will only cost you more in the long run when you have to go through the process again sooner than you would like. Communicate with your remodelers. Establish a good rapport with your kitchen designer up front to make sure all selections have been well thought out. Continuing communication with your project manager during the construction process will keep you at ease of what is happening along the way. Ready to get started on your next kitchen remodeling project? Kenwood Kitchens can help. Since opening its doors in 1974, Kenwood Kitchens has made a name for itself throughout Maryland as a complete kitchen and bathroom remodeling firm. With showrooms located in Lutherville, Abingdon, Columbia or Annapolis, Maryland, Kenwood Kitchens is the place for all of your kitchen and bathroom needs. We’re also featuring a special Wood-Mode savings event until February 24th, 2017. Don’t hesitate to give us a call at (800) 211-8394. This entry was posted on Friday, November 4th, 2016 at 1:15 pm. Both comments and pings are currently closed.